The backpacking boot has a right-out-of-the-box comfort, as mentioned by the majority. A large number of individuals admired the shoe for being lightweight. It helped them cover the extra miles without feeling the level of exhaustion they expected. Many customers mentioned that their foot did not rub or chafe against the internal walls and therefore they did not experience blistering and discomfort. A lot of hikers reported that the footwear had long-term durability. Numerous users appreciated the efficiently working Gore-Tex lining which kept their foot dry even while passing through streams and puddles. Many consumers said that the backpacking boot provided excellent ankle support which saved their foot from twisting during challenging hikes. Several hiking enthusiasts were pleased with the remarkable grip of the footgear on slippery surfaces. About a handful of owners were able to break in the Authentic LTR GTX in no time. Some purchasers commented that its price was very reasonable. 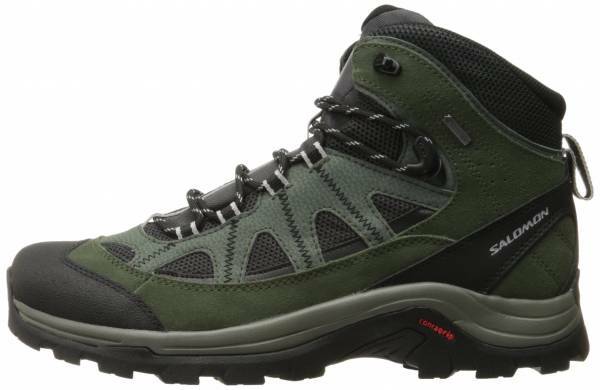 A few buyers said that the Salomon Authentic LTR GTX was a bit too narrow and, therefore, not suitable for wide-footed hikers. The rugged Salomon boot, the Authentic LTR GTX, has a nice blend of comfort and lightness. Wearers praised the boot’s remarkable traction, sufficient ankle support and long-term durability at a reasonable price. Moreover, owners delighted over its quick break-in period. Its internal walls felt soft and cushiony against the skin. The Gore-Tex lining, being both waterproof and breathable, kept the user’s foot fresh and dry throughout the hiking session. Despite receiving a good amount of approval, this Salomon gear still managed to disappoint some patrons with its too-narrow confines. [I]t's so agile, I feel like I'm wearing a trainer. The Salomon Authentic LTR GTX is a fusion of several modern technologies placed at strategic locations to give comfort, traction, and durability. Its outsole features the Contagrip technology which is both grippy and flexible. The 3D Air Mesh technology and the split leather of the upper offer breathability and comfort. They also give the shoe a neat appearance. The Gore-Tex lining provides complete waterproofness. The midsole has the injected EVA foam for additional bounce and enhanced responsiveness. Another feature is the Advanced Chassis system situated between the midsole and outsole. It stabilizes the motion, provides cushioning and responsiveness. The Salomon Authentic LTR GTX comes in the standard length and width for both men and women. Salomon built this footgear on a gender-specific last to achieve a fit based on the foot structure of male and female wearers. It generally runs true to size. The rugged boot has a semi-curved shape in the forefoot region which promote natural gait for the hikers while they are out on the trails. There is a lace-up closure for a snug fit. It also has a padded collar for the wearer’s comfort. The outsole features the non-marking Contagrip technology for delivering a blend of traction and flexibility on a variety of terrain. The feature provides enough friction to avoid slipping over tricky surfaces. Also, it allows the backpacking boot to bend as needed on sharp cuts and steep slopes, thereby facilitating the walk over rough surfaces. The injection molded ethylene-vinyl acetate (EVA) foam in the midsole is known for its increased bounciness and higher responsiveness. While it may be a little expensive as compared to the traditional compression molded EVA midsole, it returns more energy and reduces the risk of fatigue. The Advanced Chassis technology is a combination of multiple layers aimed at balancing the motion, managing energy and ensuring optimal cushioning. It also absorbs shocks and provides additional stability to the hiker by letting the plate flex under the heel when the backpacking boot is handling impact forces. The 3D Air Mesh technology in the upper allows for a free inflow and outflow of air through the material. The feature ventilates the foot surroundings and keeps the user feeling fresh even after a long day of hiking. Furthermore, the upper uses split leather which allows air to pass through, without compromising the protection it provides and long-term durability. It also enhances the overall look of the footgear. The Salomon Authentic LTR GTX features the Gore-Tex Extended Comfort Footwear technology in its upper. As a waterproof, windproof, and breathable liner, it protects the hiker’s foot from the outside elements and keeps it dry and healthy. In the forefoot region, there is a toe cap. This component protects the toes from small rocks or roots encountered on the way and reduces the risk of injury from punctures. Moreover, there is a heel strap for easy on and off. The backpacking boot has a gusseted tongue that effectively keeps out the debris and small rocks. It also provides water protection to the foot. Also, the Salomon Authentic LTR GTX has the breathable textile lining inside the upper. It gives a soft in-shoe feel without compromising the inflow and outflow of air through it. The mudguard, which is added to the base just above the sole of the shoe, protects the foot from debris and water. Another backpacking boot option from the brand is the Quest 4D 3 GTX.